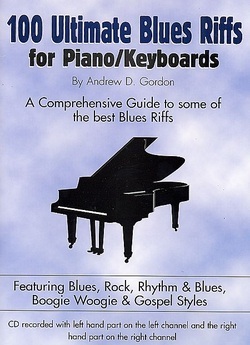 This best selling book, 100 Ultimate Blues Riffs by Andrew Gordon is an exhaustive guide to some of the best musical phrases that make up blues piano/keyboard playing. There are five sections broken down into basic blues riffs; R&B influenced Blues riffs; Boogie Woogie; rock influenced Blues riffs; gospel influenced Blues riffs The 12 bar Blues progression and the Blues scale are explained. There are two completed songs at the back of the book that shows how to combine many of the riffs to form a song. Many people have commented that this is the best Blues keyboard product that they have ever used. A must for all levels of keyboardists that want to study the blues. All 100 "riffs" are recorded with the piano right hand on the right channel and the piano left hand on the left channel along with a drum track. Learn how your favorite Blues keyboardists play including Dr. John, Leon Russell, Chuck Leavell, Jimmy Yancey, Meade Lux Lewis, Otis Spann, Nicky Hopkins and many more!